I have been sitting here trying to figure out how to start this post. You see something happened and I just don’t know how to put it into words. How do I explain that one of the things that I love most about my boy , his loving honest personality, is the very thing that scares the crap out of me? And even more important how do I explain what I need to explain to my boy, my BOY who takes everything so literal, who only thinks in black and white, who already has too many fears and anxiety? I assumed that he understood the concept of Stranger Danger, that he got it. Since he was a toddler we have talked about strangers. Safety social stories were as frequently read as the Cat in the Hat in my home. I knew my boy was friendly but I never worried about him, because I assumed he understood.When the video about the guy trying to take the girl in Wal-Mart vent viral last year… I had both my kids watch it and then we discussed it! They answered all the questions I asked correctly. I ASSUMED he understood! I WAS WRONG PEOPLE! Something happened that opened my eyes to the reality. And it scares the hell out of me. After Grace’s girl scout meeting all the kids went outside to the playground to burn off a little steam while waiting for their parents to pick them up. I had to drag Jay along with me to the meeting as I had no one else to watch him. He asked if he could play too… and after going over the rules such as don’t chase the girls, not to run (because of his foot) and to stay within my view at all times… I set him loose along with the other girls of my troop. I watched the kids run around and play, screaming and laughing, the way you do when you are 8,9 or in Jay’s case 11 years old. They were having a good time, and well that made me happy. A mom came to pick up her daughter and I started chatting with her, but still was keeping an eye on all the kids. She was just starting to ask about a possible play date with her daughter and my Grace when all the sudden my heart stopped. I did not see Jay. He wasn’t on the swing, he wasn’t hiding in the tower and then I saw him. He was sitting on a bench chatting away to a man whom I did not know nor did he look like anyone else there did either. I ran over to the bench and grabbed Jay’s hand and rather loudly so the man could hear as well said, “Jay you know better than to talk to strangers.” To which my son said, ” Mom I know his name he is not a stranger any more.” Jay was very confused as we walked away. I quickly called the other girls over as well. Jay went on and on saying how HIS NEW FRIEND told him he was there with his daughter. I thought my heart was going to burst out of my chest it was beating so fast because you see the only girls there were MY GIRLS from my troop and this man was none of their fathers! We went inside where I reported the man to the front desk. By the time we came back out he was gone! I realized that my boy did not truly understand the difference. I needed a new way to make him understand so I rephrased it and said that there are some people, grownups, out there who we can call TRICKY PEOPLE. Not tricky in a Presto Magic way but in a Trick kids because they want to hurt them way. We talked about how a tricky person might ASK KIDS FOR HELP just to get them alone or TELL KIDS TO KEEP A SECRET FROM THEIR PARENTS (including, IT’S OKAY TO COME OVER HERE BEHIND THIS TREE WITHOUT ASKING MOM FIRST. I told him how not asking Mom is the same thing as KEEPING A SECRET.Basically we re-visited the whole Stranger Danger thing. And I made sure Grace was there too… just in case. Both kids were terrified! So I had to explain that most people are nice but that we never know who a bad person is or what they look like. They don’t come with a sign on them saying Bad Person here and an arrow. Jay kept apologizing saying he was a bad boy. I told him he was not a bad boy, just a very trusting boy. We talked about how we can be polite but STILL REMAIN SAFE! We talked and talked and talked. I will no longer assume that he got it! I will keep talking about this ever so often for now on. I would rather be a nag then be the mother who sits back and said I should have kept talking! When your kids get home from school today… perhaps you might want to revisit the subject again too. You just might be surprised about what THEY DON”T GET! Oh my goodness! I would have freaked, too. You did a great job explaining it again…liked the descriptions of tricky people. I will have to use that…we talk about it often here, too. Oh goodness! That would have scared me to death. I’ve come to never assume anything with my 11yo Aspie. Every day is different even though it’s the same. AMEN to that! So true its the same but different! Wish the Big boy a HUge HAPPY BIRTHDAY (I can’t believe he is 13 already!) For us! And yup still keep needing to talk! SIGH! I completely unradstend. Folks call me overprotective. **shrugs** Their opinion on it means NOTHING to me. My son will be 3 in January and if he’s not in my care, he’s with my husband, my mother, my father, or my godsister. That’s it. Over time, as he gets older, I’ll relax my stance a little, but for right now? We’re good.MrsTDJ recently posted.. Thanks Lisa I am going to go check out her site! Wow…we just had to have the same discussion with our 9 year old son, who has Aspergers….We all thought he got it too….Then we find him riding his bike and following an older gentleman back through the campground and he stopped to talk to the guy…..Now it turned out this guy was legit, and a good guy who had told our son, he best be on his way. But, we still ran to get him because, like you said you just never know……It’s so hard to trust he will be ok if he’s out of your line of sight…..Oh I would have panic written all over me as well. See this is what I mean… they are just so curious and innocent and trust everyone! yes indeed it is hard and we need to watchthem. A whole new set of challenges one has to deal with back in the US. While overseas the major issue is terrorism but in the US it’s perversion, which is worse cause it effects our kids! I’d like to pass on 2 small tips I heard yrs ago on a talk show. The word “stranger” is not a concept children understand, so better to explain, if mommy/daddy haven’t introduced you first it’s best not to talk to the person until they ask first. The 2nd & best was to say “if you can’t see me, you have gone too far” vice “stay where I can see you.” They don’t have any idea what you can see or not. Hi- I think Nadeen has the right idea. Since kids (especially our kids ) are so literal, giving them a guideline for vetting new adults makes sense. “If you want to talk to a stranger, you have to ask permission first.” gives kids a concrete rule and also alerts us to any strangers showing interest in our kids. What worries me more is the concept of someone “known” a teacher, aide, coach, friend, etc. taking advantage of the trusting nature of kids. How do I teach my child to recognize that? Thanks for posting this. My son hasn’t (yet) been dx’d with Aspergers. He is a little TOO friendly and I get scared for him, since I won’t always be able to be with him. wow my son is 11 also and ask just like you son, Has also said their said there a stranger till you meet them. I am so glad i found this web sit! My 8yr old son’s school found out how hard it is to make him understand stranger danger last week! The TA came up to me when I came in to do my lunch supervisory stuff and told me that she watched my son go and sit down and talk to someone outside the school bounds. She said she watched him for a while and called him once or twice but he didn’t respond. She finally went up to get him and he said that the man wasn’t a stranger because he knew his name now. I have warned them that he will wander off if he finds something of interest, in this case a puppy. It scared the begeebers out of me and the TA had NO idea why I was upset with her for not going and getting him when she saw him talking to someone she didn’t know. You would think the school would not just watch what happens but actually go and get the child. She told me I needed to talk to him about stranger danger. Like I haven’t done this a hundred times before?? I was scared because had she just ignored him, what would have happened? I had a chat with the school as well that this needs to be addressed as the school is a special needs school. *hugs* from a mother who has been there and was bawling my eyes out when I got home! How scary! Thank you for sharing this. Eli is like Jay. If someone tells him his name, then he no longer considers them a stranger. I definitely need to revisit this topic with ALL of my kids. 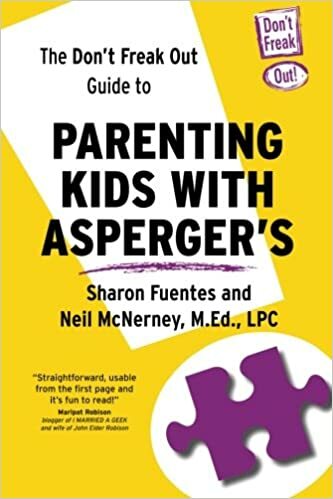 I hate to bring this up, but this kind of vigilance might always be needed with your Asperger’s child. My son is an adult (by the numbers, anyway) and has a very hard time telling when someone is a user, or a scam artist, or any number of others trying to get something from him or even cause him harm. As a late teen, he fell in with some “bad seeds” and when I tried to keep them away, they trashed our house and lawn and my son dropped out of school. He couldn’t deal with their taunting, and the school did squat about it; my horrible neighbor called the cops — on us, even though the same kids trashed a house under construction across the street; the cops did squat but at least we didn’t get a citation. The school counselor (one of only two sympathetic people in that whole building) and I were working on getting him to be more social, which with a little guidance isn’t all that hard for him, but this set things back quite a bit. We moved a few months later and he completed HS in another district through their adult ed program, though it was individual instruction and didn’t do much for the socialization effort. As an adult, he was completely rattled by someone trying to sign up customers for an alternate utility provider program (essentially a scam) who told him we had to sign the form on behalf of our actual utility provider. It took me weeks and many letters and complaints to get them to pull the binding contract. He thought he was helping us — he’s been helpful with repairmen in the past. He was crushed over all the trouble it brought. Anyway, thanks for sharing that story. It’s a crucial issue that needs to be discussed openly. Maybe it’s a female/male thing, or a neurotypical/Asperger thing, or both, but I kinda think you overreacted. 1. People with Asperger have a hard time understanding “age difference” and generally are drawn to people who are older or younger. Your son probably does not understand the difference between a child and an adult. 2. You were talking to a “stranger” as well, and talking about getting together, so what was the example being set? 4. I use a wheelchair, and while not exactly a “helicopter parent,” I watch my kids on the playground a lot more carefully than most. Therefore, I *always* have little kids coming up to me and saying hello or asking about my wheelchair or something. I try to be polite without engaging them. I’d hate it if some parent called the cops on me for being polite or trying to keep an eye on their unsupervised kid. My wife, moreover, is a school teacher, and she *always* goes up to unsupervised children and asks them where their parents are, and tries to make sure they get reconnected with their parents. Several times, she’s been greeted by the parents not with a thank you but a dirty look and the parent reprimanding the child for “not talking to strangers”–after letting the child wander freely around a store or whatever. And to teach kids that you won’t overreact to situations, so they can feel comfortable, because real child molesters play on the child’s fear off parental rebuke: “Keep this secret, or your mom will be mad.” Child molestors are also essentially cowards, and most of them will not act if they think a parent is on to them. We tell our children that, if they’re ever separated from us in pubonlic, they should seek out a parent with young children and ask that person for help, because people who harm children are going to get jobs as or pose as authority figures like police or zookeepers. In short, the best way to deal with a situation like that is to calmly come up to the child and adult and say, “Hello, sorry about my son. He’s very sociable!” And engage the other adult directly. If he really was any danger, he’d mostly likely avoid talking to you and leave. i was the same way i still am in many ways. however, i did do sohteming completely out of my element and only because my friend was there.. we dropped our kids off at Ikea’s kid playzone for 1hr while we shopped. i looked inside and saw kids having a blast and my friend assured me that it’s safe and the kids can’t come out unless they’re signed out and the badge that matches the kid’s shirt has to be provided before the kids are released. she dropped her kid there all the time whenever she shopped. so i did it and kayla took off with her bff without looking back (that hurt a little) and didn’t want to come out when it was time to go home. i tell you, it was weird doing that but at the same time, i’m glad i did because it showed me that not all places are scary!kathy recently posted..
Stranger danger is the biggest mistake of the 80s that we haven’t discarded yet!! 90% of children are kidnapped, assaulted, molested and killed by family, neighbors, and people close to the family. Stranger abductions are exceedingly rare. I learned this in 1987. My older two kids, both NT, were 6&7 at the time. Frantic trying to find them, they were in the milk mans truck out front. As they explained he’s not a stranger, you see him twice a week and talk to him (our milk got delivered around 10am, weird). I realized after sitting down asking if this person or that was a stranger that kids have NO concept of stranger. I changed it to ANYBODY right then and there. A few years later I became leader of a Boy Scout troop. I went to council and got there program changed too. I have 4 boys on the spectrum, 2 are aspies. I taught then they can’t go with anyone…not grandma, not grandpa, not his favorite uncle, not ANYONE without letting me know. Never ever. We did social stories about it. To this day, my 17 year old tells me when he is leaving, wehre he is going, why and with who ( much to the chagrin of his (few) friends). Not to even take a ride down the block to our house with grandma. Stranger Danger was just too hard for them so I simply made it everyone.